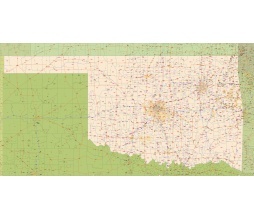 Editable royalty-free map of Oklahoma, OK in vector-graphic online store. Oklahoma State free vector map. AI,PDF. Oklahoma State vector road map. Oklahoma offers a variety of features, from grassland plains in the west to forests and mountains in the east. Most of the state is a great, rolling plain, sloping gently from northwest to southeast. Although the region is considered part of the Great Plains, Oklahoma has four mountain ranges: the Ouachita in the southeast, the Boston in the northeast (part of the Ozark Plateau that runs across northwestern ARKANSAS and MISSOURI), the Arbuckle in the south-central part of the state just north of the TEXAS border, and the isolated Wichita in the southwest.